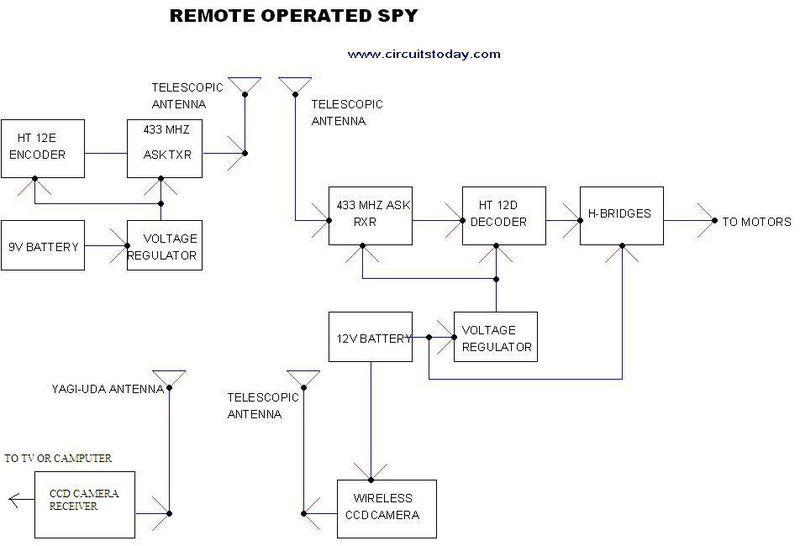 Here is a remote operated spy robot circuit which can be controlled by using a wireless remote controller. It can capture audio and video informationâ€™s from the surroundings and can be sent to a remote station through RF signals. The maximum range is 125 meters. It overcomes the limited range of infrared remote controllers. This robot consists of mainly two sections. They are explained in detail below. The circuit uses HT 12E, HT 12D encoder and decoder. 433MHz ASK transmitter and receiver is used for the remote control. H-bridge circuits are used for driving motors. Two 12V DC/100RPM gear motors are used as drivers. The working of the circuit is as follows. When we are pressing any key in remote controller the HT 12E generate 8 bit address and 4 bit data .The DIP switches are used for setting the address. 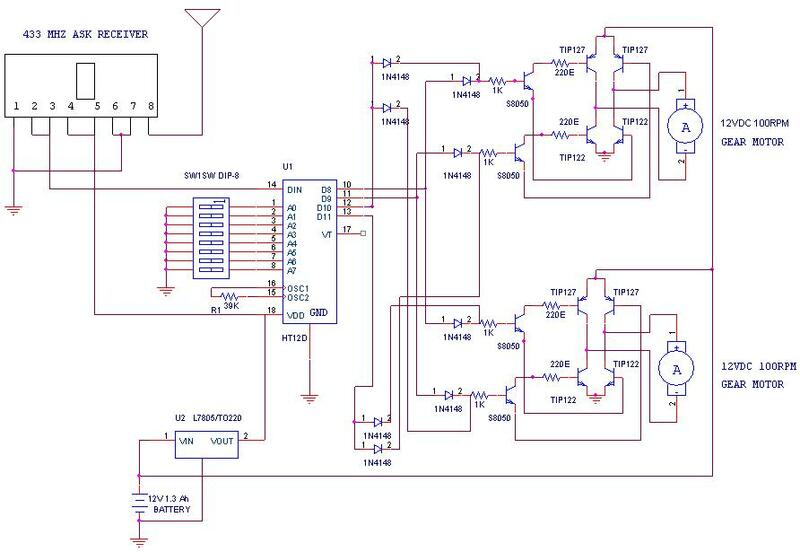 Then the ASK transmitter sends the 8 bit address and 4 bit data to the receiver Then the ASK receiver receives the 8 bit address and 4 bit data and HT 12D decoder decodes the data, thus enabling the appropriate output. Thus the output signals that are generated controls the H-bridge which then rotates the motors. 433 MHZ ASK receivers also operate at 433.92MHz, and have a sensitivity of 3uV.Â The receiver operates from 4.5 to 5.5 volts-DC. In this project we are using a wireless CCD camera. Now these types of cameras are commonly available in the market. It works on 12VDC supply. To know more about CCD camera, click on the link below. The 12 Volt DC supply is taken from the battery placed in the robot. The camera has a receiver, which is placed in the remote station. Its output signals are in the form of audio and video. These signals are directly connected to a TV receiver or a computer through a tuner card. 1. Take a hylam sheet with (20cm*15cm) size. 2. Fix two gear motors (12VDC 100rpm) in the hylam sheet by using aluminum pieces and nut bolts as shown in the figure below. 3. Fix the ball castor as shown in the figure below. 4. 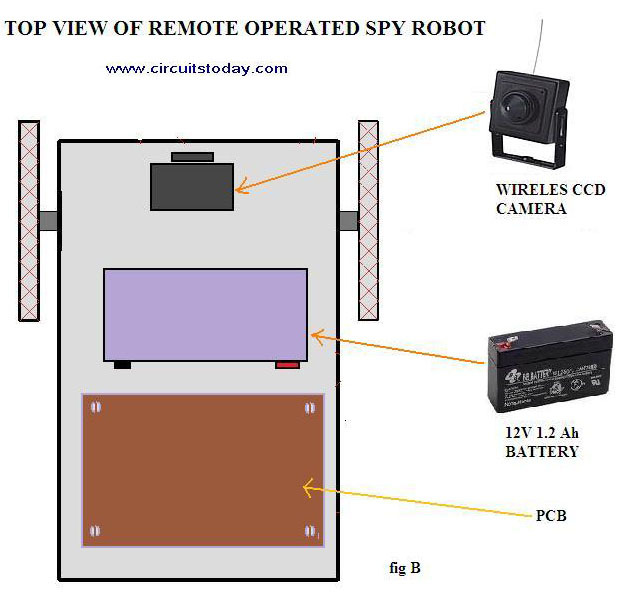 Then fix the battery (12VDC 1.2Ah) on the top of the spy robot as shown in the figure below. 5. Connect two motors to the PCB. The PCB is then connected to the battery. 6. Connect the wireless CCD camera to the battery. 7. Connect the camera receiver to the TV or computer. Video informationâ€™s will thus appear in the screen. 8. Switch on the remote controller and control the spy robot. Please send some more information about this project. which simulation software is used to simulate this circuit.I am asking this because RF module, HT12E, HT12D are not available in proteus. How to simulate this circuit. I’m final year student. i liked this project but it is. too small. sir i like this project .. please can u send me more information of this project. thank you . “Remout speed of micro cemera seted airplane. I am Ashwini Bhosale from Solapur.I am doing project on Robot.My Project title is ‘Design and Implementation of Automatic Lawn Cutter’.In my project grass can be cut by using blade according to input of display&keypad. Please, Tell me to how much may a cost &components cost details.Can you help me? My email id is ‘ashubhosale1993@gmail.com’.Please reply. ..
i want to operate this robot using android application , then how can i make this project please give information about them. 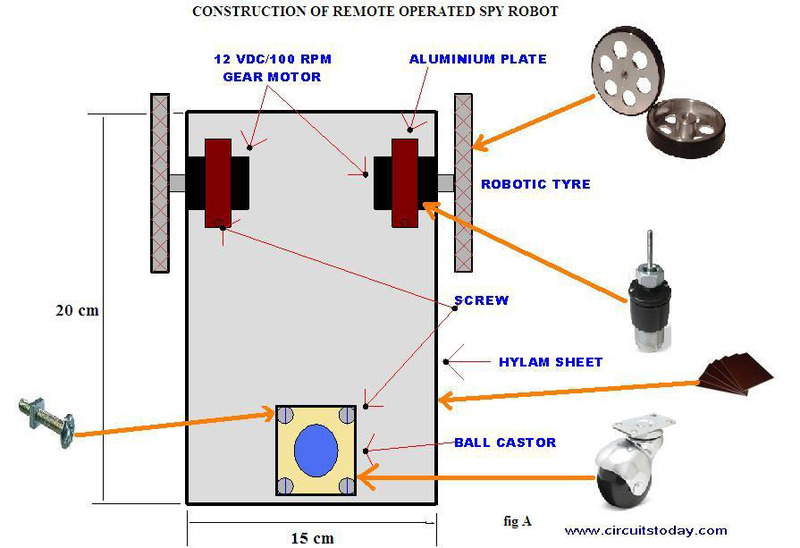 sir i like ur this robot .. i like to get more information so that i can make my own robot for min project . please can u send me more information of this project. thank you . early waiting for your mail . I want to add a rotator module for the camera too. If I use a similar circuit for that one also, would the signals get jammed? I want know how much cost to do spy can robot. which type of controller used in this project sir? if i am using four wheel sir which type of controller used and codings description also send my mail sir. m also stuck with same problem ,if u get any solution than reply me plz.. I made the complete circuit but It is not working as per described. pls give me d details regarding how to set the dip switch. sir am final year student…….. I made the complete circuit but It is runing directly while it shoule be run through remote please help me and and kindly respond me soon. how can turn this robot to left and right? there is a ball Castor wheel that you mentioned there, and how it operates? I can’t understand the remote part.You said ‘by just pressing any button on remote controller’ so that means we are going to use any remote controller(eg tv’s remote controller)? Also how can we command the robot the move right or left without a program? Lastly how to we enter the those 4bits input data? Remote is a simple 2-DPDT switches.Connect them in parallel to L-R motors and power supply.Pressing one switch forward while other one reverse will turn the robot. I m interested in this project. how much cost will come and will u provide all parts of this circuit. can we make this robot using microcontroller?give me deatils with microcontroller n also give me cost of this. i stydy BE EEE ,how to connect wireless ccd camera to tv in this project pls rly me sir. It will costs around 5000 to 6000 only. I want to know about ‘clamp switch’ using ic project. instead of using 4 tip 122 & tip127…can we use a single ic…L293D…it wud make it a little cheaper & also reduce the complexity of circuit..!! Sir, can i get the components from you? If yes how much will it cost me to get them to nigeria? I understand your problem u have faced while doing this project Mr.Amit and Mr.Priyatam. The soln of this project is to connect D8,D9,D10,D11 pins through one NOT GATE Ic-7404. Because it requires inverted data for your motor driver unit. how does the robo turns left and right? There is no mechanical part to turn the wheels left and right. I think it can move only straight direction. How does it traces a curved path? i m sagar yeldi from solapur i have 1 problem due to make this project. 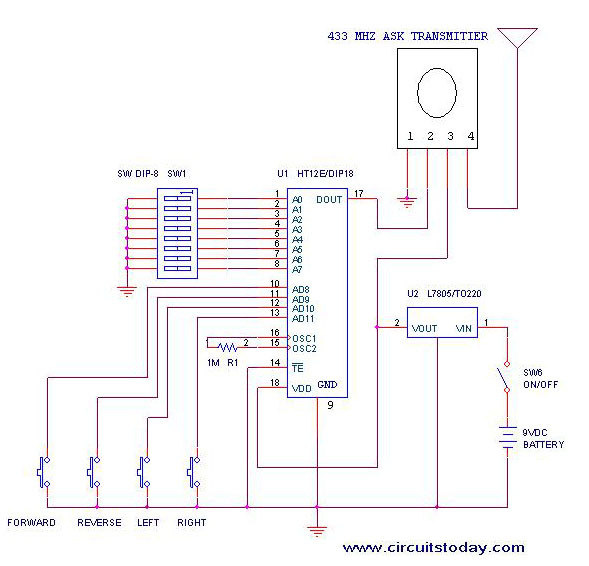 is that you published this circuit diagram is correct or not? due to i occur some problem.pease tell me your responce to my e mail address..
this project need programming or not?,,if programming is needed,can i have the programming? wow nice,pls send the cost of the project……..
ya its a good project and i gain idea about robotics for my project, i need how much cost this project will take? Do you any options for CCD cameras. And concerning the controller, you can take this idea and deploy it with a PIC controller. I have seen a circuit similar to this using a Microchip PIC controller (but i forgot where!) Just google it such as “spy robot” etc. Hi sadiq, you can buy a separate tans-receiver module instead of making one. They are available as modules. Ask for it mentioning for the frequency of operation.. I donno whether encoding is available in that modules or not. I am trying out this prjoect but it seems the components are obsolete and unavailable in Nigeria.Please do you have replacements for the encoder decoder and trans/reciever or their schematic diagram? its nice ,but do you have a transforming robot circuit and its design?